IOTA: BETA focuses on producing and publishing critical, experimental, or academic writing, either in print or in e-formats on topics related to its mission. Here, Beta means to test an idea or a process: to be experimental in practice or in thought. IOTA: BETA is a place for independent research by writers, artists and curators through offering residencies, writing commissions in the cross-disciplinary fields of art\technology, art\science, and art\performance. Click below for project pages. Curator and writer Julia Fleur McMillan writes a critical text about Ruth Marsh’s immersive video Cyberhive. IOTA: ARC presents the dome after dark for a 15-min stop-motion, sound and video piece by local artist Ruth Marsh featuring a 360 immersive environment which conjures a technologically altered, large-scale beehive. This Immersive Experience created by Ruth Marsh is a 15-min stop-motion, 360 degree video with original music and sound design by Jeremy Costello. The new work is presented by IOTA Institute and was supported via a 2-month artist residency in the Seadome. Ruth Marsh is a Canadian multidisciplinary artist of settler ancestry based out of Kjipuktuk (Halifax, NS, Canada). Her work employs an absurdist and often comically deadpan approach to address absence, longing, memory and healing both in bodies and environments. She is interested in exploring the ways in which modalities of labour can translate into enacted care: exertion as meditation, repetition as litany, effort over time as love. For several years, Marsh has been creating a series of artworks which focus specifically on bee disappearance. Summoned through an ongoing public call, hundreds of found, dead bees are sent through the mail to her Halifax studio from individuals across Canada. Once received, the bees are taxidermically preserved and meticulously repaired using discarded technology. The newly refurbished bees are then revived, frame-by-frame, through the process of stop motion animation. 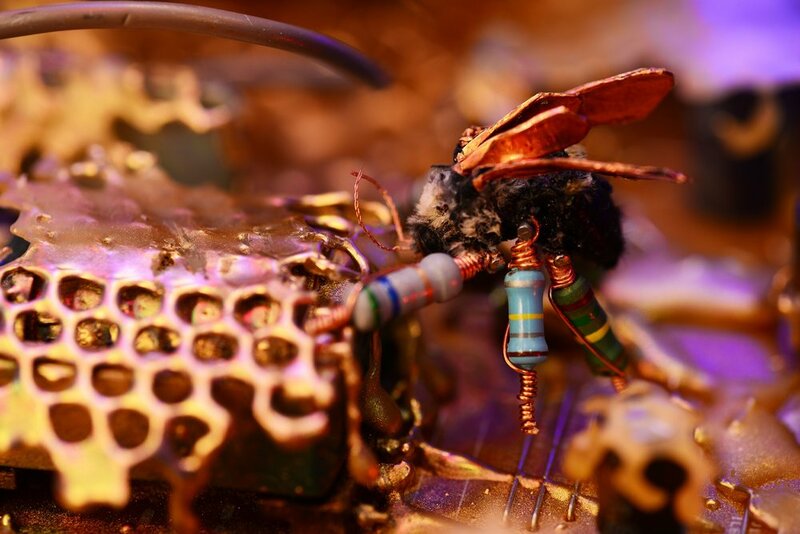 Approaching this work from a perspective which is part cyber-punk mad-scientist and part devoted repair technician, her work mindfully employs techniques which mirror bee life itself to build a wry vision of a future wherein all bees have perished due to human causes. Since graduating from the Nova Scotia College of Art and Design in 2006, Ruth Marsh's practice has spanned painting, drawing, taxidermy, video, performance, installation and stop-motion animation. Her work has been shown in galleries, museums and festivals in Canada and the US including The Confederation Centre of the Arts (Charlottetown, PE), The New Gallery (Calgary, AB) and Locomoción Experimental Animation Film Festival (Mexico City, Mexico). A critical Essay about Ruth Marsh's residency and immersive artwork by writer, curator and artist Julia McMillan, will be published in an e-publication, released on the screening premiere: October 3rd, 2018. Info on our BLOG. IOTA: BETA is launching a Bio Art project in Halifax, Nova Scotia. Working with 9 contemporary artists and three curators, who bridge the topic of life sciences through arts. Look on all platforms of social media @IOTAinstitute and on this IOTA project page for updates and sneak peaks of the team working in the lab and in the field. Prospective Futures: The Aurelia Project is a collaboration between Saint Mary’s University Senior Research Fellow, Dr. Linda Campbell, and WhiteFeather Hunter, transdisclipinary artist and Principal Investigator/ Technician, Speculative Life BioLab at the Milieux Institute for Arts, Culture and Technology at Concordia University in Montreal. (Photo: WhiteFeather Hunter, video still "blóm + blóð"
Prospective Futures: The Aurelia Project (co-curated by ethnology curator Roger Lewis) centers around healing and recovery of highly contaminated legacy gold mine tailing sites across Nova Scotia and aims to use a native plant species and a naturally-occuring bacterial species towards conducting bioremediation research and experimentation, to foster healing the land and resisting further industrial interference. The project will be supported by Environmental Studies BSc Honours Thesis student Brittany Hill, who will be co-developing and co-leading the goldenrod ecotoxicology and in-situ remediation, apprentice on dye preparation and the field of Bio Art as a part of her honours thesis project. WhiteFeather Hunter will conducting a month-long artist residency in Halifax through IOTA and will be delivering a two-day Master Class in Bio Art Wednesday October 24th and Friday October 26th, 2018. Info on our BLOG.